Hanoi oi. 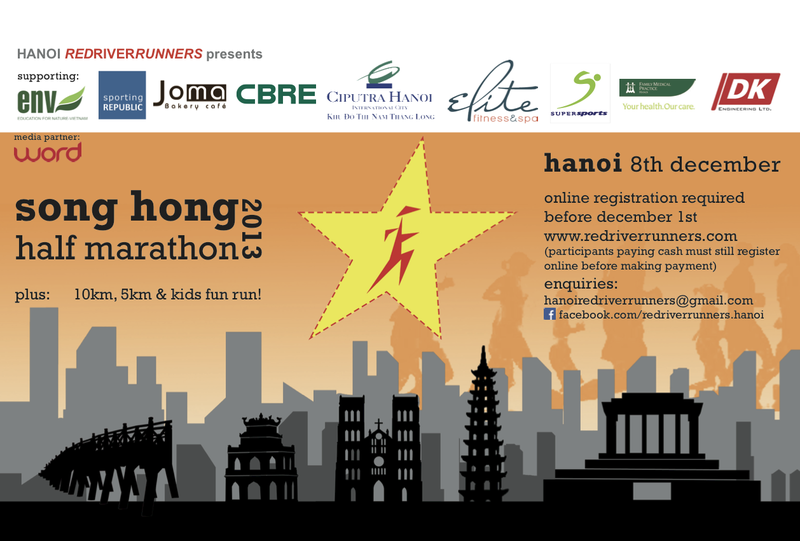 Looking forward to the Song Hong 2013 Half Marathon, 10k, 5k and kids fun run? We are! And you’ll find updates below. But this is also a great opportunity to remind everyone that the Red River Runners host two training/fun runs every week. Every Saturday at 3:55 pm, join us for a gentle run through the fields and neighborhoods of Tay Ho. We don’t go too fast or too far – only 10k or so. It’s a great way to meet fellow runners and discover new routes. The meeting place alternates between the Jafa Restaurant in Ciputra and the Syrena Centre on Xuan Dieu. Check our Facebook page Saturday afternoon if you’re unsure of the meeting place. The Red River Runners also meet every Wednesday at 7:00 pm at the Syrena Centre on Xuan Dieu for speed training. Speed training begins with a 1 km warm up, followed by 12 approximately 300-meter intervals with rests in between, and a 2 km cool down. The total distance is around 6.5 km. Both runs conclude with revelry and beer. (We don’t take ourselves TOO seriously, and – hey – hydration is important!) Join us! On to the race updates! Online registration will open very soon. Keep an eye on our Facebook page and our website. There will be a cash payment option but even if you choose to pay by cash, you must FIRST REGISTER ONLINE. Details of how to make cash payment will be found on the online registration page. Race weekend is 7th & 8th December 2013. Half marathon and 10km participants must attend race kit collection on Saturday the 7th between 1200-1500. As in previous years, the events will start and finish in Ciputra. More details about the start-finish and the course will follow in the weeks to come. We have an awesome list of sponsors to whom we are very grateful: Ciputra, Elite Fitness, DK Engineering, CBRE, Super Sports, Family Medical Practice, Joma andSporting Republic. Please check back and follow us on Facebook for regular updates.